I am getting married next July and I'm looking for an alternative to real flowers for me and my bridesmaids - I did make some bouquets with silk flowers and feathers but my groom doesn't like them, even though everyone else I have showed them to thinks they are nice. 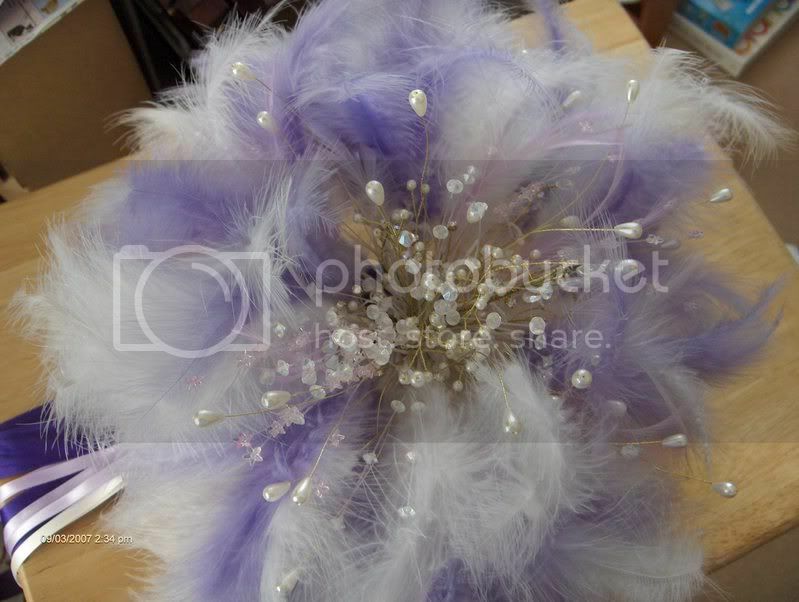 I have seen some pictures of feather bouquets but can only find onw website to order them fron and they're not cheap. They need to be quite specific as we are having a black and white theme. If anyone knows of anywhere I can order them, I'd love to hear from them! Hello Johno and welcome to the site. 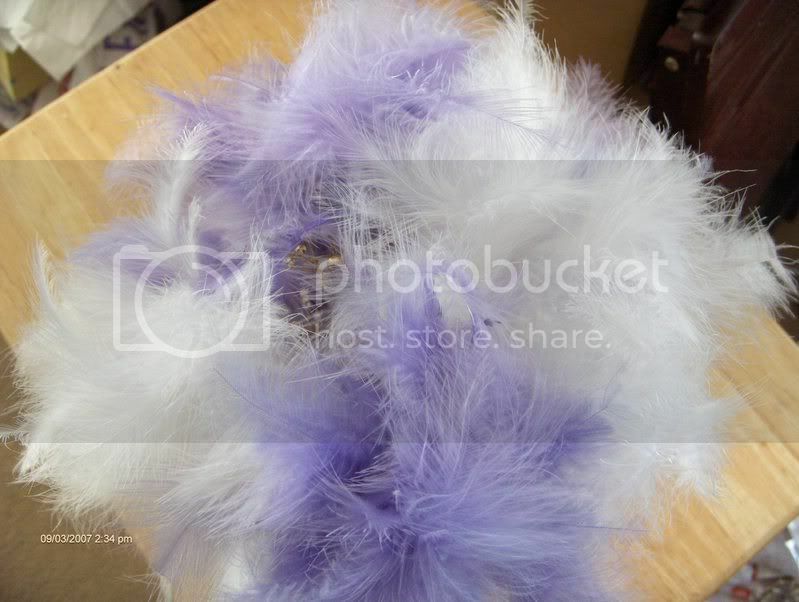 This website has quite a few ideas for bouquets that incorporate feathers. nice job penguin!!! i'm making my own too, i have made it but i haven't put it together yet!! i'm also making a cake topper!! there are a few shops on ebay that sell them, http://tinyurl.com/yqu8hs this is one i found quite liked the look of!! i would also recommend angel interiors, they are probably my back up if mine is a disaster!!! It was finding Angel interiors that started me off on this route really because I wanted something different and heard about crystal bouquets and when I googled it they came up and they are based in the town I grew up in and still spend alot of time in! Spooky but I like to think that there is something in that! I too have made a cake topper and believe me it was a nightmare trying to find the cone thing to put the wires in cos I don't want to poison everyone! Good luck with making your own too! I found it very cheap to do and got all the stuff from hobbycraft! where did you get the cone? i've seen them mentioned on the cake toppers on ebay. i've really enjoyed making the bouquet found it really therapeutic!!! I got the cone in a cake shop well one that sells stuff to make cakes! Is the shop I went to they do different sizes mine isn't huge but about 2 inches long and I found it enough to put in some decorations but not loads. Hope that helps! I found making them therapeutic too!!! Get quite bored now with nothing to do although I did get some tiara bands and have made a couple of them too! what a great web site for flowergem4u! Thanks for sharing! Hi..I've found this web site..They may be able to help you..They did me. you could try these?? They do lots of wedding stuff.